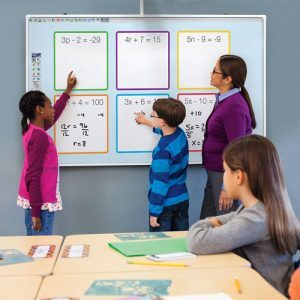 If you haven’t heard already, Mimio announced a new addition to their interactive whiteboard line a couple of weeks ago – the MimioBoard™ Touch Board. This new board is super cool and we are looking forward to getting one to have onsite in our ET Training Facility. ET Team Members Dustin, Jen, and Mike got to play with the MimioBoard Touch Board at the Mimio Summit in September, and Jen was convinced that this just might be her new favorite technology! The MimioBoard Touch Board allows you to use what best fits your style as the input device. As with other Mimio boards, you are welcome to use the stylus that comes with the board. However, you can also use simply your finger to input information. The MimioBoard Touch Board also offers a stylus for alternative input. 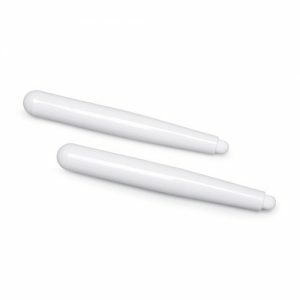 A former preschool teacher, Jen really loves this attribute because sometimes holding the stylus is harder for “little people” that haven’t quite got down the mechanics of holding a writing utensil. Special education students might also benefit from being able to choose their input style. In addition, this board has 6-point Touch 360° interactivity that allows multi-touch and gestures. For Windows users, that means you’ll be able to have 6 points taking place at one time – maybe 6 students at the board using one finger or 3 students at the board using two fingers. Whether you’re working math problems or have several students working on one map, students will be able to write or manipulate objects above, below or parallel to each other with no worries! It’s a TRUE dry erase board. 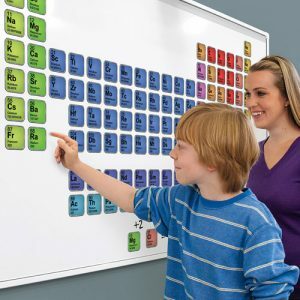 This board surface is a true dry erase board made of porcelain on steel. Yes, that’s right…porcelain that’s pretty enough to make whatever you project or write on it look awesome but rugged enough to hold up to whatever the classroom throws at it (literally). This surface is also erasable (truly) so when you won’t have to have a heart attack anytime someone wants to use a dry erase marker on your touch board. In fact, we’d suggest that you encourage it! Lightweight construction makes it EASY to install. These boards weigh in at only 30 pounds (for the 78″ model) and 36 pounds (for the 87″ model). That means it won’t take an army to lift and install this board, and the two included brackets make installation a breeze. Installation under 15 minutes? Yep, we like that idea. So, there you have it…our MimioBoard Touch Board favorite aspects. Check out our MimioBoard Touch Board product page for more information and download a PDF flyer containing detailed specs.